Left to right: Craig Maguire (BBA SJ ’92), Branch Manager & Associate Portfolio Manager, RBC Dominion Securities; Lori Smith, Manager, Public Affairs, Atlantic Provinces, RBC; Tom Gribbons (BSF ’83), VP & Branch Manager, RBC Dominion Securities; Kayley Reed (BPhil ‘14), co-founder and CEO, Wear Your Label; Roger Howard, Regional President, Atlantic Provinces, RBC; Dhirendra Shukla, Dr. J. Herbert Smith ACOA Chair, UNB; Luc Pellerin, VP, Commercial Banking Services, RBC; Mara Payn-McGrath, Regional Vice President, Western NB, RBC. 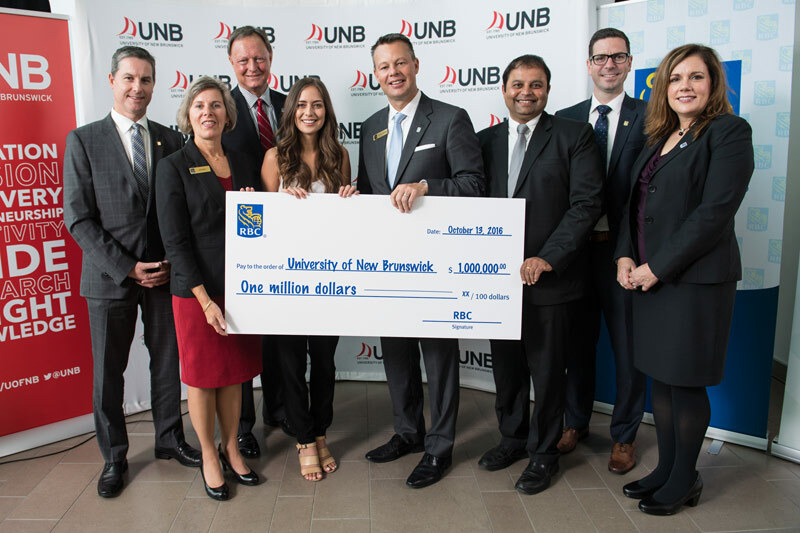 Students at the University of New Brunswick (UNB) who want to change the world now have more opportunities to develop their entrepreneurship skills thanks to RBC, Canada’s largest bank. RBC announced today that it is making a leadership gift of $1 million to support innovation and entrepreneurship education at UNB’s Dr. J. Herbert Smith Centre for Technology Management & Entrepreneurship (TME). The creation of the RBC Innovative Action Room, a new space for meetings, consultations and mentorship events. “The University of New Brunswick is a place where meaningful experiential education changes lives,” said Roger Howard, RBC’s Regional President, Atlantic Provinces. "We wanted our contributions to focus on innovation, helping students connect their vision with community needs and develop the skills to turn bright ideas into successful new ventures." Royal Bank of Canada is Canada’s largest bank, and one of the largest banks in the world, based on market capitalization. We are one of North America’s leading diversified financial services companies, and provide personal and commercial banking, wealth management, insurance, investor services and capital markets products and services on a global basis. We have over 80,000 full- and part-time employees who serve more than 16 million personal, business, public sector and institutional clients through offices in Canada, the U.S. and 36 other countries. Trish Vardy: Advisor, Public Affairs & Community Relations, RBC Royal Bank, (902) 421-4105. David Stonehouse: Senior Manager, Communications, University of New Brunswick, (506) 458-7925.